This is an image of the Peace Bridge from the other side, displaying the full view of the bridge itself and the scenic view of the city side. The Peace Bridge was inspired by Maurice Harron’s, ‘Reconciliation /Hands Across The Divide.’ The Peace Bridge was a hope for a more equitable future, joining the hearts and minds of the people together. 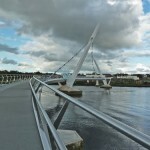 The Peace Bridge was officially opened on the 25th of June 2011, the purpose of this bridge was to unit two sides of Derry, the Waterside and the City Side. The Peace Bridge was formally opened by EU Commissioner for Regional Policy, Johannes Hahn and Taoiseach Enda Kenny, alongside the First and deputy first Minister. These two sides were in constant controversy and showed great hostility to one another. This bridge is a symbol of the unity of these two sides thus the name Peace Bridge. It is one of the largest and most ionic projects to be completed. The design and construction of this project was granted 14 million pounds which led to this peace filled symbol to stand between and rejoin these two sides. The weekend of it’s opening was filled with mass celebration of this historic event in which thousands of people came from all sides to celebrate their reunion as Derry City became united. The Peace Bridge was officially opened at 3pm on the 25th of June, when a chorus of 600 singers from the schools across both sides will make their way down the bridge itself. Up till this month over 700,000 people have crossed the bridge itself. 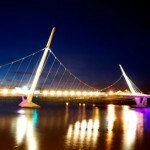 When Derry City was officially named City of Culture 2012 the Peace Bridge was the main attraction and is owner of 4 prestigious awards to highlight elegance as well as cutting edge architecture. The Peace Bridge was used to facilitate the Olympic Torch that crossed it on the 4th of June 2012. 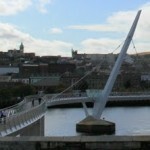 The bridge is a cycle and foot walk bridge across the River Foyle. It has a total length of 235 (length of two and a half football pitches) metres and a width of 4 metres. The design is a self- anchored suspension bridge which took almost 2 years to complete. At night the Peace Bridge is illuminated which shows a beautiful elegance lit up. 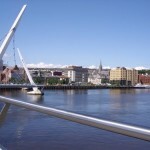 The bridge is located on the River Foyle which is situated in the heart of the city. It is home to many luxurious places to stay including Derry Bed and Breakfast which is walking distance from the city centre. 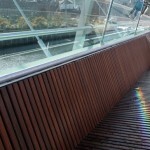 Therefore the bridge will be seen to regenerate the river for many activities such as scenic walks and cycles.